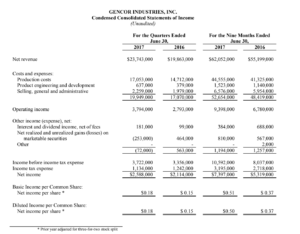 August 3, 2017 (PRIME NEWSWIRE) – Gencor Industries, Inc. (Nasdaq: GENC) announced today net revenue for the quarter ended June 30, 2017 increased 19.5% to $23.7 million from $19.9 million for the quarter ended June 30, 2016. Gross margin was 28.2% for the quarter ended June 30, 2017 compared with 25.9% for the quarter ended June 30, 2016. 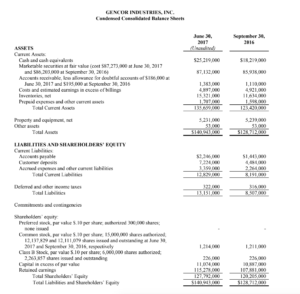 Selling, general and administrative expenses increased $280,000 to $2,259,000 for the quarter ended June 30, 2017, from $1,979,000 for the quarter ended June 30, 2016. Operating income for the quarter ended June 30, 2017 was $3.8 million compared to $2.8 million for the quarter ended June 30, 2016. The Company had net non-operating expense of $72,000 for the quarter ended June 30, 2017 compared to net non-operating income of $563,000 for the quarter ended June 30, 2016. Net income was $2.6 million, or $0.18 per basic share and diluted share, for the quarter ended June 30, 2017, compared to $2.1 million, or $0.15 per basic and diluted share, for the quarter ended June 30, 2016. For the nine months ended June 30, 2017 the Company had net revenue of $62.1 million and net income of $7.4 million ($0.51 per basic share and $0.50 per diluted share) versus net revenue of $55.2 million and net income of $5.3 million ($0.37 per basic and diluted share) for the nine months ended June 30, 2016. At June 30, 2017, the Company had $112.4 million of cash and cash equivalents and marketable securities compared to $104.2 million at September 30, 2016. Net working capital was $122.8 million at June 30, 2017. The Company has no short or long term debt. The Company’s backlog was $37.9 million at June 30, 2017, compared to $21.4 million at June 30, 2016. John E. Elliott, Gencor’s CEO, stated, “Gencor had another solid quarter with revenues up 20%, gross margins of 28%, net margins of 11% and a significant increase in our backlog. Backlog of $37.9 million entering the fourth quarter increased 77% year to year as we closed a number of opportunities after the ConExpo show. Deliveries of equipment are scheduled for the fall and early winter months. This is atypical, as customers historically require delivery of equipment between late winter and spring. Current quoting activity for fiscal 2018 is encouraging as it is higher than this time last year. We see solid opportunities across all regions of the US and improving activity in Canada.